Mung beans are a healthy alternative to meat. They are relatively high in protein, iron, magnesium and especially vitamin B6, which is needed for proper absorption of vitamin B12. Heat the oil in a large pan. Fry the onions and garlic for 2 minutes until softened, making sure not to burn the garlic or it will turn bitter. Add the mung beans and the water, cover and boil for 30-45 minutes. Check after 20 minutes or so, to see if the mung beans are soft. If not, boil for longer. 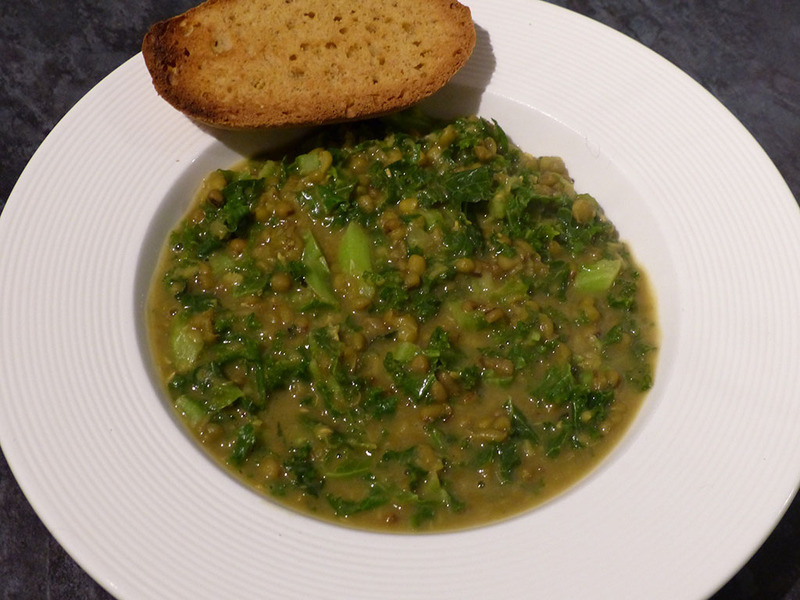 When the mung beans are cooked and soft, add the kale and boil for just 5 more minutes. Sprinkle around 1tbsp Engevita per portion on top. Serve this nutritious soup with naan bread heated in an oven and spread with Biona coconut oil.